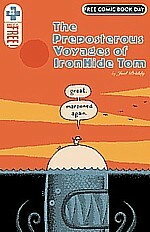 The Preposterous Voyages of Iron-Hide-Tom! It can't get much less than this and still be called a comic book. "Why not?" you might question in your ignorance. Certainly, a price can't be less than free and that's what The Preposterous Voyages of IronHide Tom cost during the recent, annual "Free Comic Book Day" honored by thousands of comic books shops across America. In addition, anything less than stick-figure doodles would be prose, not art. And IronHide is stick figures from a tiny IronHide Tom atop a submerged monster on the front cover to the final panel of a despondent Tom stranded on some alien planet. Therefore, knowing the preferences of your beloved (or not) reviewer, you are now prepared for nothing less than a rip-roaring criticism of this comic book from AdHouse Books.IronHide Tom is nothing less than fun, fun, fun. Why? Who wouldn't love the wild adventures of this crusty old sailor who rubs shoulders with mermaids, marries a tornado, is tossed about by two Cyclops, and discovers the great beasts that actually hold up our flat earth. Tom's tales are told is the grand old tradition of lies SO big (wink, wink) that no one believes them but everyone enjoys them anyway. But what about ye old reviewer's axiom that great comics are a perfect wedding of art and word with neither element overshadowing the other? Huh! What about that old axiom thing? Er. Uh. Charles Schultz couldn't really draw well either. The Preposterous Voyages of Iron-Hide Tom/30 pages/words & art by Joel Priddy/available at www.adhouse.com. MINIVIEW: Skyscrapers of the Midwest #3 [AdHouse]. From the 'life is worthless' philosophy and drawn in a scratchy, impressionistic style, teen-aged, nasty, anthropomorphic cats (I think; it's hard to tell) treat each other like crap in what may be Middle School. A giant, unexplained robot stumbles around.